New & Used Computer Cabinets | ACE Industrial Equipment, Inc. 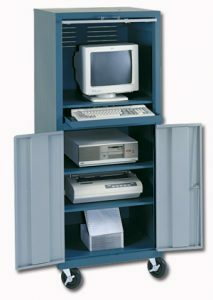 The new and used computer cabinets from Ace are designed with both safety and security in mind. Locking compartments allow access only to the components that are needed, protecting them from theft, dirt, debris, and other threats. The computer cabinets are fully vented to allow sufficient airflow for cooling. New and used computer cabinets have adjustable shelves to accommodate any size equipment, and some are large enough to house a printer as well as the computer. Used cabinets are completely inspected for safety to keep your computer in good condition. Ace’s cabinets are mounted on sturdy, rugged casters with brakes for easy maneuverability. Call Ace today for the best selection and prices on a new or used computer cabinet. For more information about the new and used computer cabinets Ace offers, please call 1-800-300-6034.